The main short coming of the NB6Zep for this band is the lack of a half wave (or greater) resonance on 80 meters. 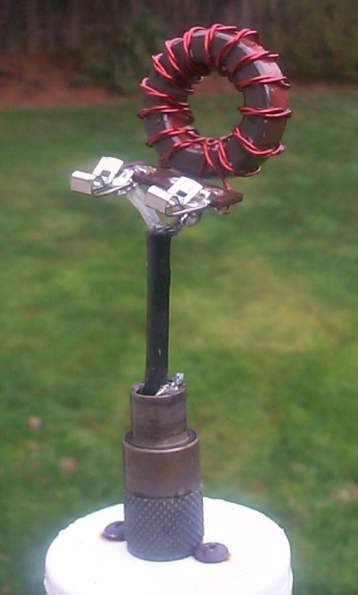 Adding inductance is the way to lower the resonance of the wire for 80 meters. All center-fed wire antennas are balanced, and so inductance must be added equally to both halves of the antenna. End loading a wire is the most efficient way to do this. By placing the 80 meter loading coil further down each leg, efficiency on 80 meters is increased. The required larger inductor will in turn act as a choke to restore the NB6Zep to it's original characteristics for 40-10 meter operation. See the NB6Zep Antenna for details of the basic antenna. Since adding inductance to each leg was required, adding an additional 3 feet of wire on each end of the original dimensions restored the NB6Zep to a full sized 20 meter EDZep. A large inductor is placed at the end of the additional 3 feet of wire on each end of the NB6Zep and then a 17 foot length of wire is added to complete the circuit on each end. The overall wire is now approximately an electrical half wave on 3500 Khz. The over all increase in each leg is approximately 21 feet (3' plus 17' plus the length of the coil) and this section should be dropped down vertically (or close to a 90 degree angle) from the horizontal length of the wire. Basic Construction: I used a B&W coil stock 3026 (10" of 2" diameter air wound stock with 8 turns/inch). I carefully cut it into 2 equal halves of 40 turns each. I added strain relief inside each coil and soldered the extra length of wires (17' & 3') to the strain relief. CLICK for DETAIL I attached the short wire of each 80 meter extensions to each end of the original NB6Zep. I tied off the vertical legs of the NB6Zep to nearby fences using a length of nylon twine. You may make your own coils and still get good results! The inductance you are looking for is approximately 27.5 uH or about 700 ohms of reactance at 80 meters. Look in the hand books for construction methods and dimensions that will work for you. (2" OD PVC pipe is one idea that comes to mind.) Make sure you do a good job to make both coils exactly the same and add strain relief for the windings. The exact value of the coil is not as critical as the matched value of the coils. To reduce any RFI in the ham shack, I added a "coax choke" (purchased from Radio Works) to the unbalanced side of my 4:1 balun. CLICK for DETAIL This is not strictly necessary, but is good practice for keeping TNCs and PC speaker from acting up. You may also make your own chokes with toroid cores as described in the hand books. Add them at either or both ends of your coax to counter the effects of any imbalance in your antenna. 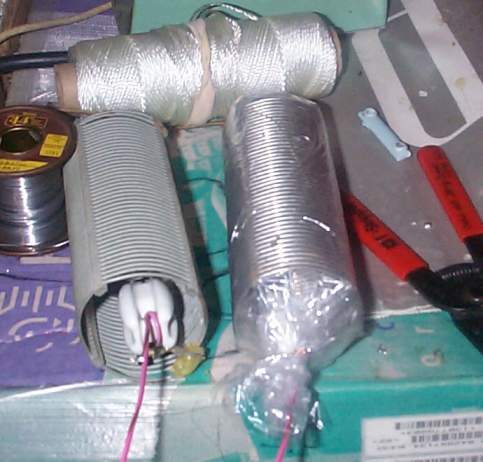 Basic Performance: The added loading coils will increase inductance for smoother tuner operation on the 80 meter band. Over all 80 meter performance will be similar to that of a half wave dipole. I have enjoyed 80 meter contacts on MFSK16 to many east coast stations in the two weeks since completing the modification. The loading coils will act as an RF choke to isolate the modifications from the rest of the antenna for 40-10 meter operation. Performance on these bands will be as described for the original NB6Zep with the exception of 10 meters. On the 10 meter band, the additional wire that was added above the coil (choke) will have a significant impact on the 10 meter pattern. The effect is 8 equal lobes in all directions. Each lobe has unity gain at a very low angle. The results for me has been good DX operation in all directions.